Sgt. 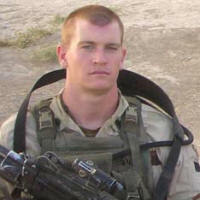 James (Jimmy) J. Regan was assigned to company C, 3rd Battalion, 75th Ranger Regiment when he was killed by an IED which targeted his vehicle in northern Iraq in February, 2007. Deeply affected by the terror attacks of 9/11, Sgt. Regan rejected lucrative wall street job opportunities and law school scholarships to volunteer for military service and entered the Army in February, 2004. Sgt. Regan, of Manhasset, New York, was an exemplary scholar-athlete at Chaminade High School where he was recognized for his academic, sports and community achievements. As a result of his academic record and his All-American achievement on the lacrosse field, Jimmy Regan was recruited by Duke University on a lacrosse scholarship. While there he led the Duke team to two ACC championships. He graduated with a degree in economics and was poised on the brink of a happy and fulfilling life when he answered the call to defend his country. Graduating first in his class in infantry basic combat training, he received the distinction of "Soldier of the Cycle." Moving on through the Basic Airborne course and Ranger Indoctrination Program at Fort Benning, Jimmy served in the 3rd Battalion, 75th Ranger Regiment as machine gunner and gun team leader, and finally fire team leader, serving in Iraq when he was killed. In addition to two deployments to Iraq, Sgt. Regan had also deployed twice to Afghanistan in support of Operation Enduring Freedom. Shortly before his death in 2007, he was promoted to the rank of Sergeant. Sgt. Regan's awards and decorations include the Army Achievement Medal, the Army Good Conduct Medal, the National Defense Service Medal, the Global War on Terrorism Service Medal, the Afghanistan Campaign Medal, the Iraq Campaign Medal, the Army Service Ribbon, and he was posthumously awarded the Bronze Star Medal, Meritorious Service Medal and Purple Heart. His decorations include the Ranger tab, the combat infantryman badge, the expert infantryman badge and the parachutist badge. Jimmy's loss was an immense tragedy to everyone who knew and loved him. He left behind his loving fiancee, his parents and three sisters. Through the Lead the Way Fund, his family and friends strive to honor his spirit, his patriotism and the way he lived his life by combining their efforts to give back to his brothers, the U.S. Army Rangers.